I had been looking forward to sketching Pike Place Market’s grand expansion since documenting the location two years ago. Unfortunately, my enthusiasm for the beautiful project came down a few notches when I stumbled upon this barrier on the north end of the renovated grounds. The concrete and wooden eyesore not only blocks views between both public spaces, it prevents visitors from walking back and forth between the new Market Front area and Victor Steinbrueck Park. If you’ve seen it, you may have asked yourself this question: Why aren’t the market and the park connected? 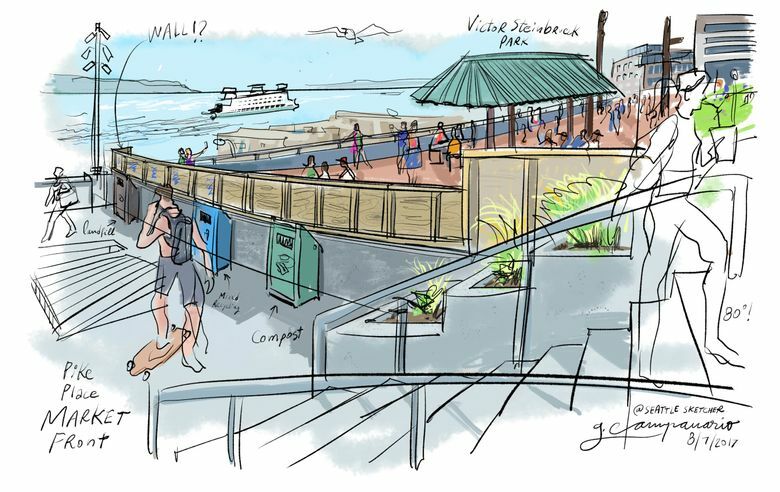 Ben Franz-Knight, executive director of the Pike Place Market Preservation and Development Authority, said a connection has always been part of the project, but it is tied to plans to renovate Victor Steinbrueck Park. Before park upgrades are scheduled to start in the fall of 2018, the Market and the Seattle Parks Department are working on a temporary solution: cutting a hole in the wall and installing a temporary gate. “We hope to have that in place in the next month,” said Franz-Knight. I wonder what Steinbrueck, the local architect (and sketcher!) who rallied to save Pike Place Market from demolition in the 1960s, would have to say about the planning behind all this. Since the Market Front opened in late June, thousands of visitors have already encountered this useless wall in what Steinbrueck once described as “one of the grandest downtown lookout places” in Seattle.